I cannot think of a healthier meal for a toddler ( or an adult for that matter) than a vegetable soup. As adults, Andrew and I love a simple vegetable soup as a low calorie and tasty alternative to any meal. In fact, a big bowl of vegetable soup fills you up and only “costs” you 100-160 calories ( the way we prepare it). 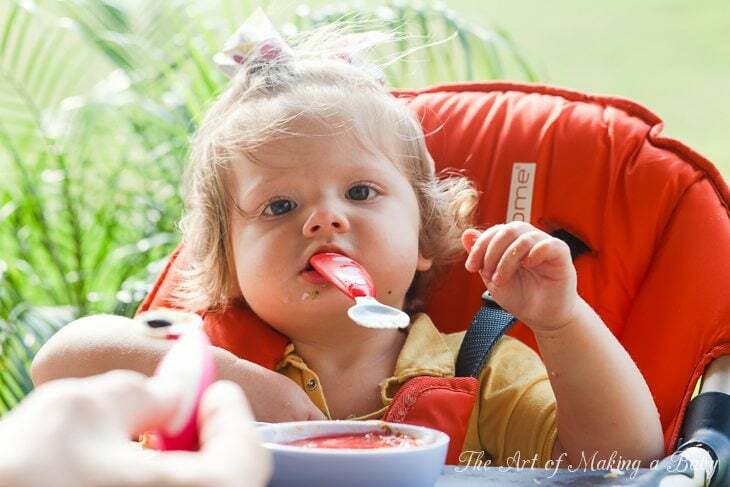 For toddlers, though, a veggie soup packed with more hearty vegetables, offers hydration and those precious vitamins and minerals that many babies reject. Obviously, offering a picky eater a vegetable soup won’t make him suddenly eat vegetables. Alexis eats vegetables just fine and that’s why this type of soup is her absolute favorite. However, even at times when she rejects certain veggies, this soup is always welcomed by her. The key to managing all these vegetables is to make sure that you either pre-cook them or if strapped for time add them based on how fast they cook. Or if you really don’t have time, you can always just drop it all at once and let it simmer for a long while together. If I have the time or the energy I try to pre-cook the vegetables while the water, potatoes and cubes are getting to boil. 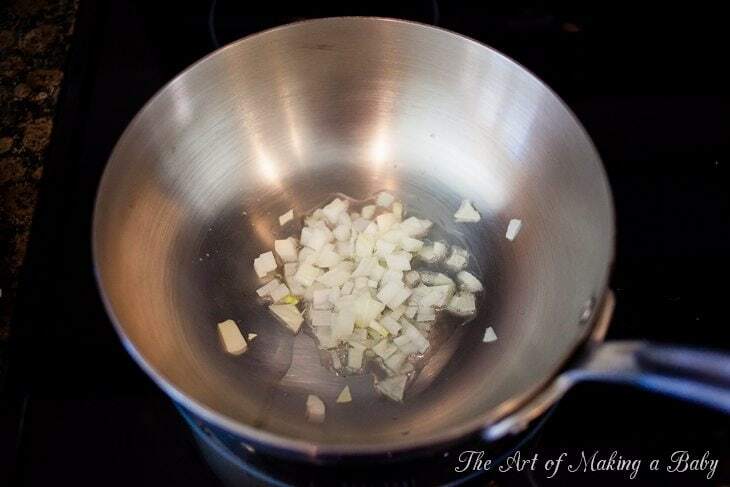 The rule of thumb for me is to cook onions and carrots together in canola oil ( I wouldn’t recommend olive oil for hot cooking due to its low smoking point). This gives the soup a pretty yellow color and a nice taste. 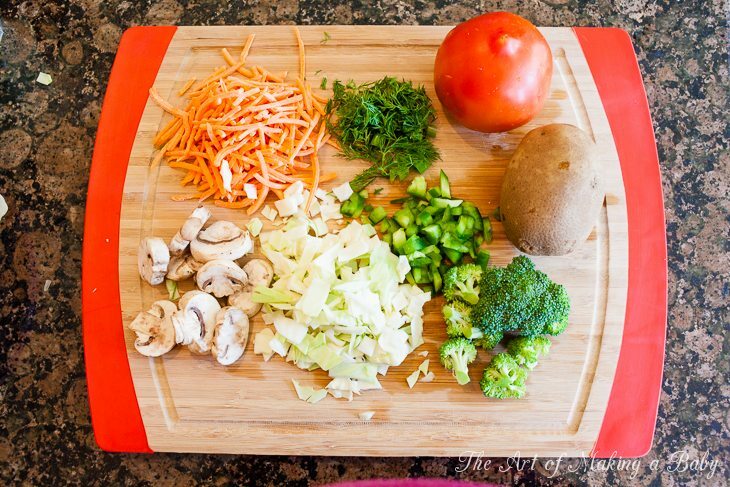 You can also throw some other veggies like peppers, mushrooms and broccoli to saute in a pan in the meantime. Finally, when the water is boiling you can add frozen peas and pasta if needed along with other pre-cooked vegetables. If you’re not precooking, then throw the raw vegetables in first, let them boil for quite a bit before you do the final stuff. Things like pasta should not be overcooked so keep the recommended 5-7 minutes for whole grain pasta in mind. Greens and tomatoes go last, dill is added for garnish. This soup can be kept refrigerated for 3-4 days and tastes even better the next day. I didn’t even get a chance to take a good clean picture of it, because the second I put it on her tray, she was all over it. If I can’t get her to eat anything, I know that a vegetable soup will do it. The best part: no salt, good protein (if peas and whole grain pasta are added), healthy veggies, easy to make and makes for awesome leftovers. Lexi loves it so much that I make sure she has some every day. 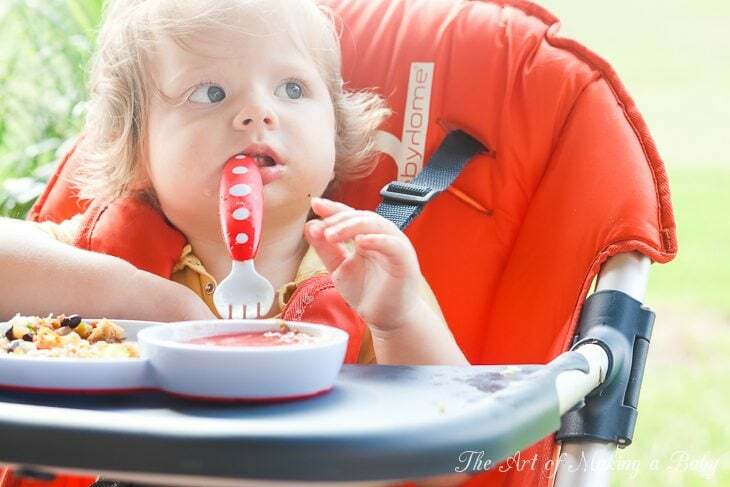 Keep in mind that if your toddler isn’t used to soups or vegetables it might take a few tries to get him to eat it or like it. My mom taught Lexi to slurp the water from the soup right from the bowl, like “a kitty would do“, and it has proven to be a valuable tool. Whenever she’s not eating, I ask her to show me how a kitty drinks her soup and she eagerly picks up the bowl of soup and slurps all that liquid-y goodness. This soup makes for a great meal for babies, too. If you’re using a BLW method of feeding your child, it’s perfect because it lets them pick off vegetables from the soup. If you’re into purees, it purees well and can be put into a to go pouch like Squooshis or spoon-fed. Alexis sure is a cutie! Did you do anything in particular to help her learn how to pick-up food and put it in her mouth? My son has figured out how to pick-up Cheerios and put them in his mouth, but he just pokes at other foods we have tried (peas, bananas, etc.). We’ve tried putting it in his mouth for him so he knows it’s food, but he just doesn’t seem to “get it” so we keep spoon feeding purees. Any ideas? 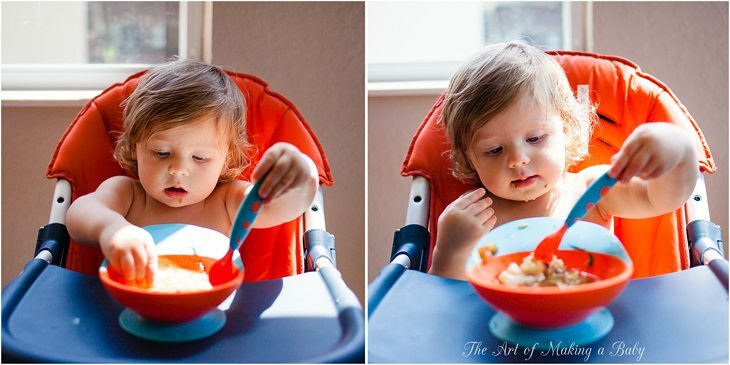 We used a Baby led Weaning method of introducing solids, so she was eating with her hands from the beginning. It’s actually natural to them, so if you maybe try and let him explore on his own. he’ll figure it out if he’s given ample time to try. Does Lexi use her left hand or her right hand more? I really can’t tell at this point. It might be close to equal, because I haven’t noticed a preference. I see her holding things with her left hand often, but that’s probably because I am not used to it, so I am noticing it more. My daughters love soups as well. Just be careful about feeding that to Lexi everyday with bouillon cubes. The very first ingredient of the one you linked to is yeast extract which is a hidden form of MSG, a known neurotoxin. Many food producers have replaced the MSG with yeast extract because it doesn’t require E-number labeling. It is probably easier to just make your own vegetable broth so you can make sure it doesn’t contain sketchy ingredients. It’s good to keep it in mind though. I didn’t even thing twice about it containing yeast extract. And it’s true, making a soup without those is just fine as well. It tastes just as good. Free glutamate IS what makes MSG taste good; it is the active ingredient. MSG and yeast extract have the exact same effect on the body. I just wanted to let your readers know since it is the very first ingredient in that bouillon and therefore full of a hidden source of MSG. Also, a quick question: why would you not use any salt? I though a small amount is not harmful to babies and goes a long way to enhance taste. In Chinese trandition, for instance, salt is not avoided for babies/children in small amounts as it is considered to be beneficil for our health. Of course, using natural sea salt. Salt: I see no need to add salt. Salt changes our taste buds, it makes us want more salty spicy things and reject things like vegetables that taste bland in comparison. I would know, I LOOOOOVE salt. Babies can’t handle salt as well as adults do. I do not believe salt is beneficial (despite what the chinese say lol) Luckily, she eats bland things just fine so I haven’t had to resort to taste enhancements, except for the cubes maybe that contain spices and herbs. There’s too much sodium in most commercial foods that she will eventually be eating, so I’d like to get her started without the salt preference. She gets her fats from fish, nuts, avocados, occasional nut butters, eggs and most importantly breast milk, calories from all that plus grains, legumes, potatoes. Having a bunch of vegetables in a bowl isn’t a bad thing 🙂 It doesn’t need to be “balanced out”. You just have to make sure she eats all kinds of food groups in general. when you give Lexi nuts, how do you do it? most nuts are tough – does she do OK chewing them? I would like to introduce nuts, but I am not sure if they are a choking hazard or just plain inappropriate for this age as many babies still do not have all the molars necessary to break them down? Hemp seed hearts work well for my daughter. They taste sort of like pine nuts and are an excellent source of iron and zinc. Great find with organic unsalted cubes! I must try that! Haha no one said anything about balancing with a steak! I was mostly just curious about what else she eats throughout the day to get those fats and calories. This is def a great soup for getting some veggies in them. I was actually asked to do a post about her food during the week. Currently trying to take pics of her meals when I remember. Great post! Definitely going to try this soup with my daughter! I’ve been looking everywhere for a tasty vegan soup that she can actually eat! 🙂 I’m with you on the salt, most foods already contain some sodium, I’m not going to put even more in my daughters body. Especially when she loves her vegetables just the way they are! New reader here, and I’m loving that you’ve done your research into a number of things – especially plastics and chemicals – that I have my own concerns about and research as well! 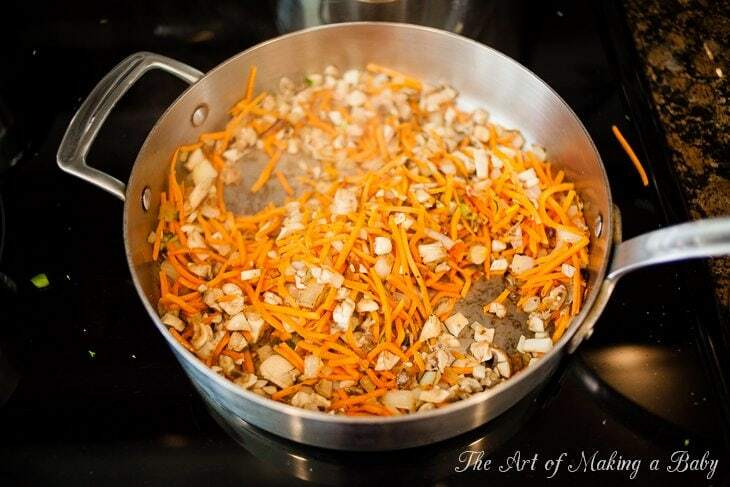 Just a thought – have you ever thought of using Extra Light Olive Oil for sautéing rather than Canola? ELOO has a much higher smoking point than Extra Virgin and still carries the benefits of olive oil, just with a higher smoking point and no distinct olive-flavor.